Went down to Toa Payoh HDB Hub to collect the goodie bag that Taka Jewellery had kindly offered to every participants of its Most Creative Message contest that it had organised on its facebook page last month. 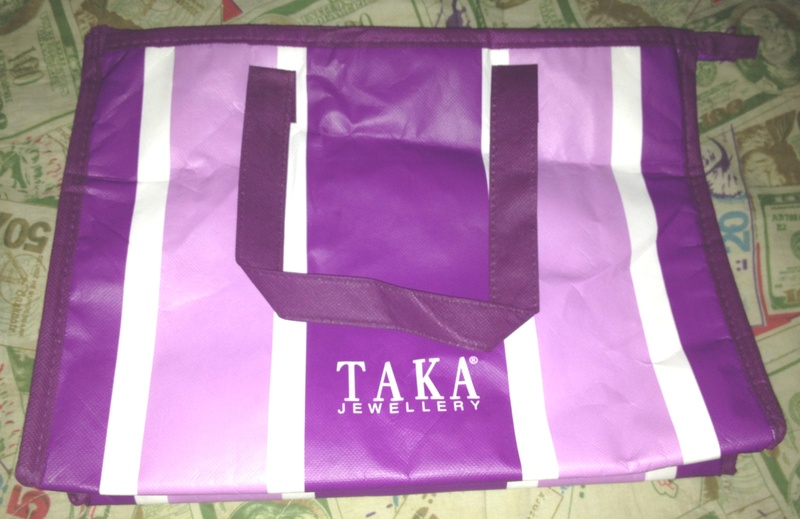 Although I’m sad not being able to win the lovely prizes, the gesture of goodwill from Taka Jewellery had neverthless touched the heart of all participants, including me. Isn’t that so sweet and nice of them? And these are the contents inside my goodie bag. The original gift should be an exclusive Cooler Bag & 2 Glitzy Candle Holders. But guess they run out of stock for it and I was given other things instead. Am so happy with my gifts. Hooray to yet another prize won from contest. This time, its a Goldkili + Frezfruta goodie bag from U-Weekly. I love contest! A million thanks to the two lovely gentlemen who had accompanied me all the way to SPH News Centre at Toa Payoh to collect the Goldkili + Frezfruta goodie bag that I had won from U-Weekly. God knows how long it would take me to reach there if I were to go there by myself. I was so happy when I received an email from Teach Yourself Club informing me that I had won myself a goodie bag. And since they mentioned the word “Exclusive” in their email, I reckon that the bag will contain fabulous items. But I was soon to be proved wrong. Yup! I did not put up the wrong picture. These are the contents of my “EXCLUSIVE” goodie bag. I had a tendency of crying on the spot the moment I got hold of my goodie bag. So much for traveling all the way from Telok Blangah to their office at 1 New Industrial Road (Nearest mrt station is Bartley). If I had know the content, I would definitely give it a missed. While the prizes from the previous two giveaways are on its way to the winners home, I’m happy to announce the start of a brand new one. Are you all ready for it? Rules are simple as always. All you have to do, is to be the first 3 friends to complete the shady puzzle above and email it to me at ireneyksoh@yahoo.com.sg. Do also drop me a comment here saying: ” Shady Puzzle Completed! I want My Goodie Bag”, so that I can take note of your entry. 1. 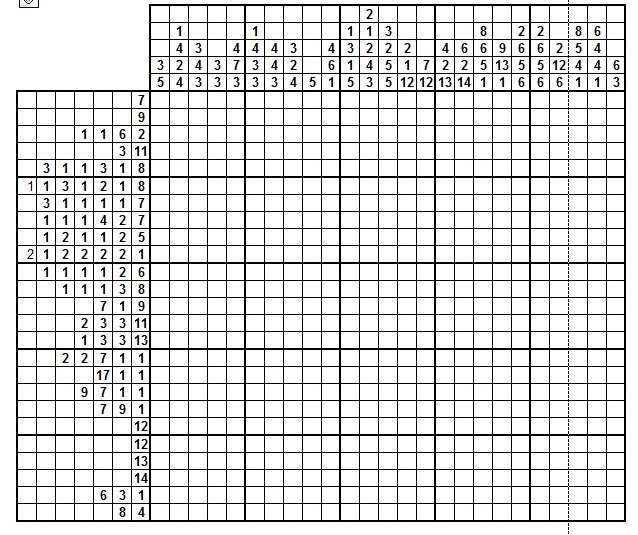 Each number represents a continuous block of squares that need to be shaded in that row or column. 2. Each comma represents at least one empty square between two blocks of shaded squares in that row or column. 3. The first square of each row or column need not be shaded. It’s the time of the year again- Shape Run Carnival. And this year, not only do you get to exercise and tone up your body, you also get the chance to do charity and be rewarded with a Hearty Delights cookbook. First 500 donors will also received an exclusive Shape Run 2011 Reebok Runner’s Tee with compliments of Reebook. Last by not least, a goodie bag worth S$30 with every copy of Shape magazine purchased at the carnival. And the awesome free gifts that comes with magazine subscriptions. Oh boy! I sure love roadshows and carnivals. A million thank to my lovely Aunt Mei and Cousin Zhenzhen,who had so kindly helped me purchased 2 copies of LiveWell magazine during their roadshow at Chevron House last tuesday. Every copy of the magazine purchased entitles one to to a goodie bag and an additional chance to get my hands on products ranging from S$22.90 and more. And that’s not all, they even kindly dropped by my workplace to pass me the bags. I’m indeed blessed. Everything in the pictures are items found inside my goodie bag, except for the Herbal Slimming Tea and Viaritril-S Glucosaminie pills which was the sure win lucky dip prizes. Don’t they look tempting to you? Not to worry if you missed this roadshow. LiveWell Woman will be having a second roadshow from 22th to 24 April 2011, 11am to 7pm at United Square (Main Atrium). Mark it down on your calendar now and start counting down to the happening day. More details, please checkout their facebook page HERE.